I like to live dangerously, on the edge of my seat. I go where the wind takes me, and love to experiment and try new things all of the time. I’m a true rebel, wild and free. Okay, so those last three sentences were complete fiction. Well, not complete fiction. Sometimes, I like to live dangerously by going 4 miles over the speed limit in a 40 mile an hour zone, but only if there are several other cars going over the speed limit. And when I say I like to experiment and try new things, I really just mean going through the grocery store in a different order than my usual pattern (but I don’t do that a lot, since it means getting out of my comfort zone. I mean, what happens if they run out of avocados because I decided to go through the bulk section of the store first? True story. Okay, not really). I know I have your rapt attention now, you’re probably just hanging on the edge of your seats waiting to see what else I’ll reveal, huh? The one place I do like to experiment is in the kitchen. I love whipping up meals, and making friends taste test my successful (and unsuccessful) recipe developments. 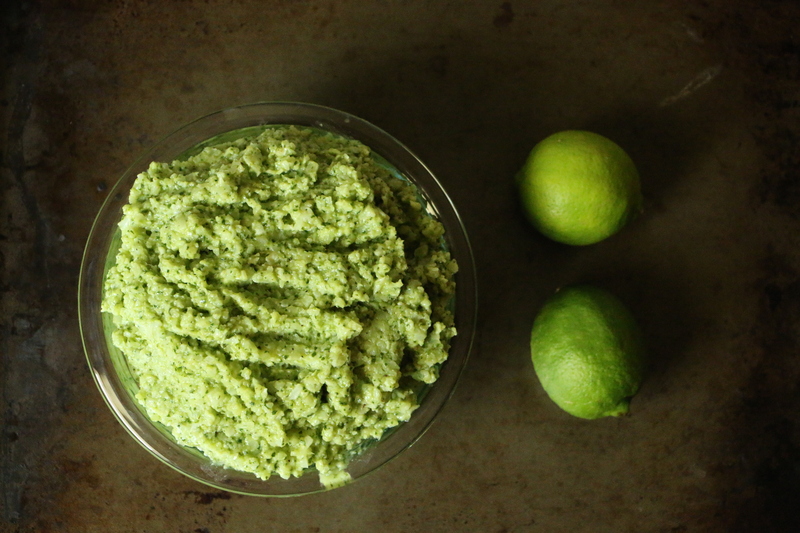 This particular recipe for Creamy Avocado and Cilantro cauliflower rice turned out to be very tasty, and I’m excited to share it with you. I have mentioned the versatility of cauliflower in a previous blog post here, and decided to use it to create a delicious side to take with me as a contribution to a BBQ party with some friends from my CrossFit gym a couple of weeks ago. Does continuing to exercise for 2-3 seconds after the instructor calls time during a CrossFit WOD (workout of the day) seem dangerous to you? If so, I’m bad to the bone. Be a rebel, and try out this recipe 😉 Let me know how it turned out in the comments! 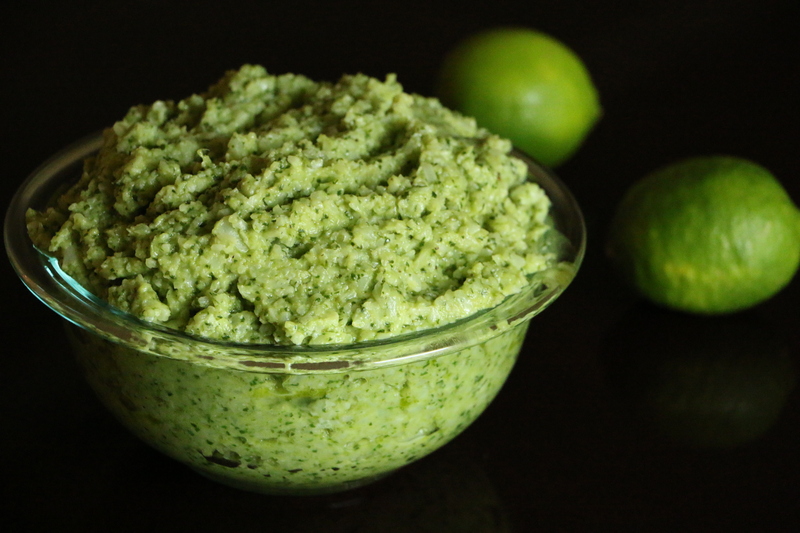 CREAMY AVOCADO AND CILANTRO CAULIFLOWER RICE – recipe adapted from Girl Meets Paleo. Place cauliflower florets in a food processor, and pulse until the cauliflower is the size of small grains of rice. You will need to “rice” the cauliflower in several batches. Heat the ghee over medium high heat in large skillet. Once the ghee is heated, add the riced cauliflower to the skillet, and saute the cauliflower rice on medium high heat for 6-8 minutes until cooked through. Once the cauliflower is cooked, turn off the heat and set aside. Place all of the ingredients for the sauce In the food processor, and puree until smooth. Pour sauce mixture over the cauliflower rice, and stir to combine. Pour mixture in a bowl and serve immediately. You can substitute coconut oil for the ghee to make the recipe vegan friendly. I made this recipe for a large crowd, so it makes a lot of servings. I would recommend cutting the ingredients in half (and using the same instructions) if you want to serve this for a smaller crowd. Tags: avocado, cilantro rice, clean eating, limes, paleo, Primal, vegan friendly, vegetarian, Whole30 | Permalink.